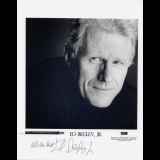 Edward James "Ed" Begley, Jr. is an American actor and environmentalist. Begley has appeared in hundreds of films, television shows, and stage performances. He is best known for his role as Dr. Victor Ehrlich, on the television series St. Elsewhere, for which he received six consecutive Emmy Award nominations, and his most recent reality show about green living called Living With Ed on Planet Green with his wife. New Response (Success): Sent a 4x6. Got it back signed and personalized. New Response (Return To Sender): Tried to forward to ?Crown Publishing Gro..